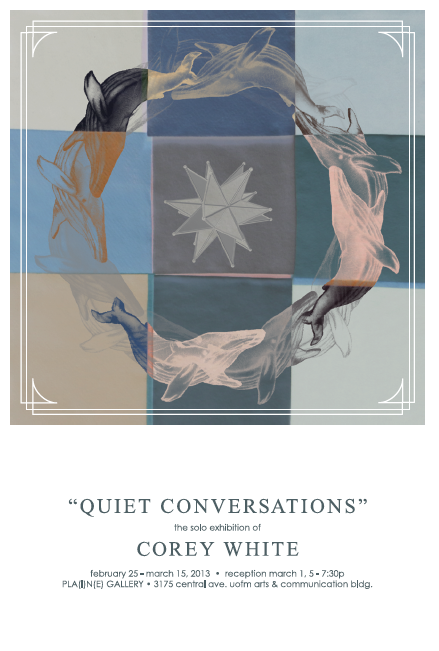 PLA(I)N(E) gallery is excited to announce its eleventh exhibition- "Quiet Conversations," which explores notions of transformation, beauty and fluid reality. Work will include video installations, paintings and mixed media collage. Reception Friday 3/1/13 5-7:30pm. Exhibition will run 2/25/13 - 3/15/13. PLA(I)N(E) is the new, student-run gallery at the University of Memphis, and is located in the Art and Communication Building, 3715 Central Ave, room 100.